January 15, 2013 (Ramona)--On a warm spring morning in the Upper Borrego Valley in 2003, the last 29 wild horses in East County--were rounded up by helicopters and driven into pens. They were then removed from Coyote Canyon and trucked to a sanctuary in South Dakota through a snow storm with temperatures 4º below zero. All 19 pregnant mares lost their foals. The stallions were scheduled to be gelded, but just in time four were rescued by Kathleen and Robert Hayden with the help of the Bureau of Land Management. The couple now houses the stallions on their ranch in Warner Springs Valley at the south end of Lake Henshaw with hopes to reestablish wild horses in East County. This is close to the site of the Garra Revolt, an Indian uprising in 1851 during which the Indians drove ancestors of these horses, along with cattle, into Coyote Canyon. In the 1800s, desert and mountain wilderness areas were claimed by the federal government. The Coyote Canyon area was transferred to Anza-Borrego Desert State Park in 1984. Through bureaucratic oversight, the historic migratory ranges were not inventoried, and subsequent to the land transfer the herd’s historic home was usurped. First the wild cattle and later the rare horses were rounded up. 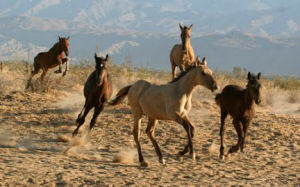 Though the horses had been thriving in the area, California State Parks claimed they were feral and invasive. They ordered a UC Davis study, but research eventually showed their foraging did not infringe on the ecological niche of the bighorn sheep for food or water. This herd of horses has the heritage hoof prints of old San Diego County. 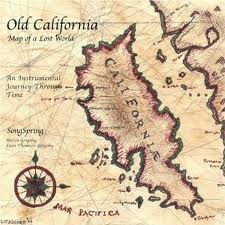 A fascinating history of early Californians, the Spanish, Native Americans, and their horses and livestock was presented by Kathleen Hayden at the monthly meeting of the Lemon Grove Historical Society as part of their History Alive series. A small group crowded into the cozy living room of the H. Lee House Cultural Center on Thursday, January 03, 2013 to learn the history and future of the Coyote Canyon Caballos d’Anza. 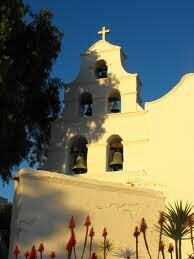 The story begins in 1769 when the first mission, Mission San Diego de Alcala, was founded by Father Junipero Serra. The missions supplied horses with Spanish bloodstock to the outlying Rancherias, including the present day Warner Hot Springs Resort and Ranch. Kathleen Hayden explains that it was a “reintroduction,” as fossil remains of horses have been found at La Brea tar pits and Coyote Canyon that are up to 20,000 years old. These colonial Spanish horses were the ancestral vehicle on which Spanish and Mexican occupation, Native American ranching, and western settlement evolved. Not the same as mustangs, these horses are smaller and more refined with a square conformation. Some are chestnut brown and some are dun. They amble in a way similar to the Peruvian Pasofino. An interesting characteristic is their formation into a circle when threatened, with smaller or vulnerable horses on the inside. Unlike domestic horses, they are vocally gruff and rough, sometimes drawing blood. The four rescued stallions are listed by the Equus Survival Trust as rare, critically endangered, and extinct in the wild. 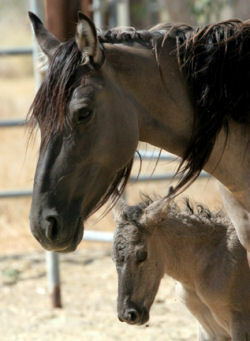 For purposes of genetic recovery, BLM sent 14 mares from a Southern Utah herd to be bred to the stallions. These mares were from a segment of horses that survived the Thomas “Pegleg” Smith and Chief Walkara raids into Utah along the Old Spanish Trail in the 1840s. Chief Walkara, a Ute Indian Chief, was once the most wanted man in California for his horse stealing. None of the Utah horses were from Warner Springs, but DNA tests reveal they are the only other horses in existence representing the colonial Spanish in California. They are called desert zebra duns. Their colors are predominantly dun; red duns or black roans, with very few browns. These mares are currently on leased pasture land offered by a rancher on Highland Valley Road in Ramona near the Grasslands Trail. A Heritage Herd sign is posted on the south side of road about ¼ of a mile past the Rangeland Road intersection. So far, the venture has been successful. One filly was born in 2012. 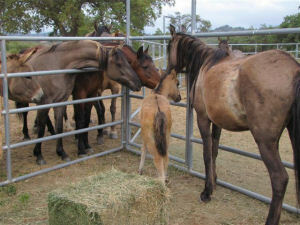 Seven foals are due in May 2013.The ultimate goal is to release them back into the wild near their native regions at Beauty Mountain Wilderness in San Diego and Riverside Counties. BLM has title to the public domain from Chihuahua Valley to the Cahuilla Reservation, which includes Beauty Mountain. The Coyote Canyon Herd ranged between these mountain valleys even before 1851 when they were driven into Coyote Canyon. This history is an important factor when considering compliance with several historic preservation laws. In the meantime, an organization has grown up around this herd, in partnership with BLM: Coyote Canyon Caballos d’Anza, Inc. The Haydens are the founders, and the board members live throughout San Diego County. The organization has been working with equine geneticists to bring the herd back to a healthy level, approximately 125 horses. This can take up to seven years. They have created a Declaration of Proclamation that they hope will bring the herd under the protection of San Diego County and restore their genetic viability for future generations. It can be read online at www.heritageherd.com. The Proclamation is before the San Diego County Board of Supervisors now. This non-profit 501(c)(3) is also being helped by Congressman Darrell Issa and, now with redistricting, Congressman Duncan Hunter. The Declaration will enable BLM to revise their management plans to comply with historic resource conservation, enhance grant opportunities, and foster grazing options. According to Hayden, we the people own the horses, because they are part of our heritage and symbolize the American West. In 1966, Congress passed The National Historic Preservation Act, which states “Congress finds and declares that the spirit and direction of the nation are founded upon and reflected in its historic heritage, providing a sense of roots and identity.” A later act of Congress, the Wild Free-Roaming Horses and Burros Act of 1971, gave special status and protection to wild horses. The stallions and mares represent a distinct population segment of species that evolved and survived the harshest desert environs and nature’s challenges. Those interested in visiting the herd may contact Coyote Canyon Caballos d’ Anza Inc. at 760-782-3340. Anyone wishing to donate may do so at www.heritageherd.com. With the high price of alfalfa, the cost to feed just one horse is about $18 per week. When they are released back into the wild, their cost will be as before they were removed: nothing. Organizations and individuals are requested to please contact San Diego County Board of Supervisors to urge them to pass the Proclamation. Through the efforts of their good stewards and others, the Coyote Canyon Caballos d’ Anza will again run free with the spirit of the wild.